The well-known periodic table of the elements contains 83 naturally-occurring elements. Of these, it is thought that all elements heavier than carbon were scattered in the final devastating explosion of a star called a “supernova explosion.” The heaviest element produced in this explosion is uranium (a nuclide 238U). It is presumed that about half of the elements between iron (atomic number = 26) and uranium (atomic number = 92) were synthesized via highly neutron-rich nuclei under the extremely high temperature and density environment produced by a supernova explosion. However, thus far no one has succeeded in experimentally reproducing such neutron-rich nuclides, and no direct evidence in cosmological observations has been obtained to prove the hypothesis that such neutron-rich nuclides are produced in supernova explosions. Therefore, no definite conclusion can be drawn regarding the origin of the elements. One of the major missions of the RI Beam Factory — a next generation of accelerator facility — is to experimentally study the fundamental properties of nuclei, such as mass and lifetime, and mechanisms of nuclear reactions for nuclides from iron to uranium that are thought to be produced in a nucleosynthesis process called “rapid neutron-capture process (r-process)” for the first time in the world, contributing to the elucidation of the origin of the elements and thereby expanding the knowledge of humankind. At RIBF Astro-Nuclear Physics Project, researchers are pursuing a unique approach to address one of the biggest puzzles of the Universe: “How and where in the universe were the heavier elements produced and how did they reach our planet?” They pursue this question through close collaboration among many experts in nuclear physics, astrophysics, meteors, and accelerators. In the epoch-making paper entitled "Synthesis of the Elements in Stars" published in 1957, Burbidge, Burbidge, Fowler, and Hoyle tried to explain nucleosynthesis with nine physical processes. R-process is one of them, so named by these researchers. Nearly 50 years have passed since their original work, and understanding of the eight other processes has been advanced; however, the basics of how and where r-process nucleosynthesis occurs have remained unclear. In 2002, Discover magazine published a feature story, "The 11 Greatest Unanswered Questions of Physics" and described a question, “How were the heavy elements from iron to uranium made?” as the third topic. 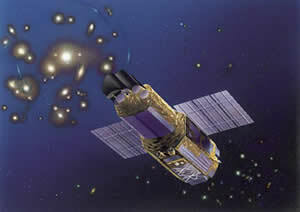 The X-ray satellite Suzaku has the world’s highest sensitivity in detecting X-rays in the energy range between 1 and 10 keV, extending the observation capability from elements to nuclides. 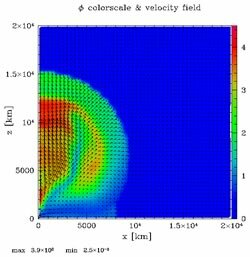 In the aforementioned overview of this research, we assumed that the r-process nucleosynthesis occurs in supernova explosions (for supernova explosions, please refer to “Environment: practical model of supernova explosion.”). However, what kinds of astronomical phenomena in the universe were associated with the r-process nucleosynthesis remains unknown. Supernova explosions are the first candidate phenomena for inducing the r-process nucleosynthesis, but this should be confirmed by astronomical observations. Researchers at the RIBF High Energy Astrophysics Laboratory, in collaboration with experts of X-ray astronomy at RIKEN’s Cosmic Radiation Laboratory and the Japan Aerospace Exploration Agency (JAXA), are aiming to observe characteristic γ-rays emitted in the decays of unstable r-process nuclides produced in supernova explosions and its remnants using onboard observation apparatus installed in Japan’s X/γ-ray satellite that will be launched in near future. This would identify the actual locations of the r-process nucleosynthesis in the Universe. 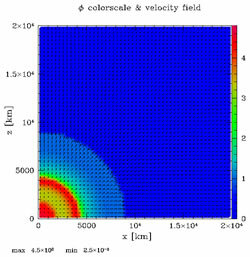 Distribution of entropy in a spherically symmetric explosion (left) and a prolate explosion (right) 1 sec after a shock wave becomes stagnant (computer simulation based on a delayed explosion scenario).